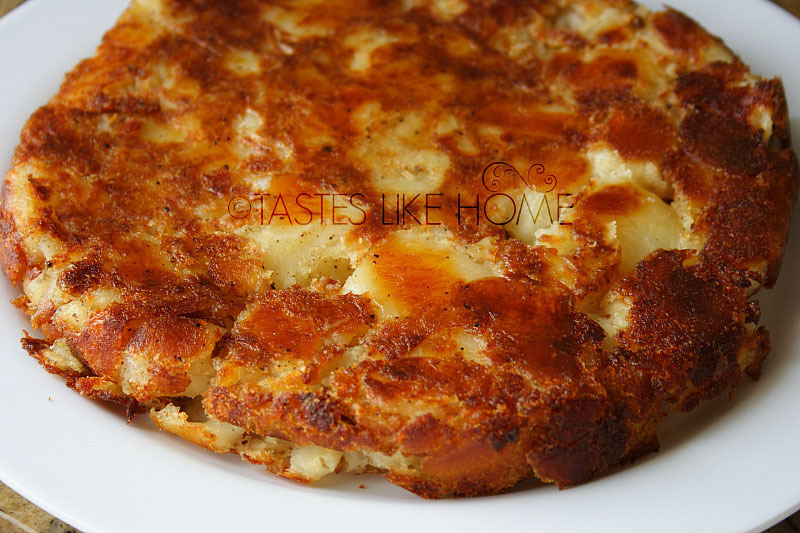 Think of this dish of crusty potatoes as one giant roastie. Roasties are British-style roast potatoes. The potatoes are peeled, parboiled, bashed around a little in the pot once drained, or some people run the tines of a fork over the surface of the potatoes to make it rough. When the potatoes are roasted, the outside layer becomes brown and crusty while the inside is fluffy. They are a treat. To make this one-pan of crusty potatoes, I boiled the potatoes in salted water then crushed them leaving some large chucks among the lot. The seasoning was simple – freshly ground black pepper and a few pats of butter. Finely minced rosemary, thyme, marjoram or fresh oregano are herbs that can be mixed in as well. The ideal pan for this would be a cast iron or a pan of similar properties – can retain high heat evenly and be transferred from the stovetop to the oven. You can also cook this dish on the stovetop but if you do, it would be a good idea to get another pan or pot of heft to place on top of the potatoes to ensure that they are evenly touching the surface of the pan. Peel and boil potatoes in salted water until fork tender. Drain well and crush potatoes, leave some large chunks. Season with black or white ground pepper as well as a few teaspoons of butter. Toss with a fork to mix and fluff. Drizzle 3 – 4 tablespoons vegetable/Canola or any neutral flavour oil that can stand up to high heat; swirl the pan so the edges get coated with the oil as well. Place pan over high heat until hot, almost to smoke point, (this will give a good sear and create a firm crisp crust on the potatoes). Add potatoes to the pan and spread out in an even layer. Use a flat spatula or the back of a pot spoon to press the potatoes firmly into the pan and to ensure that it is making contact with the bottom and sides of the pan. Cook for 5 minutes on high heat, then reduce to medium and cook until the edges of the potatoes start to brown. Transfer pan to the oven and cook for 25 – 30 minutes or until the edges are brown and shrink from the sides of the pan. Remove pan from oven and let rest for 15 minutes before inverting pan on to serving plate. 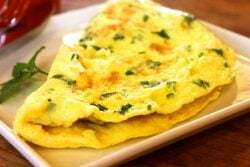 Garnish with chopped chives or minced parsley (optional). Cut into wedges and serve while still very warm as a side dish. If you want to make this entirely on the stovetop, cook on high heat for 12 – 15 minutes until the edges start to brown, then reduce to medium-low and cook for 35 – 40 minutes or until the edges are brown and shrink from the sides of the pan. If you have a heavy bottomed pot or pan that can fit neatly into the pan with the potatoes, use it to press down the potatoes during cooking to ensure it connects to the pan. It is important to put enough oil into the pan so that the potatoes are able to come away easily once cooked and rested.